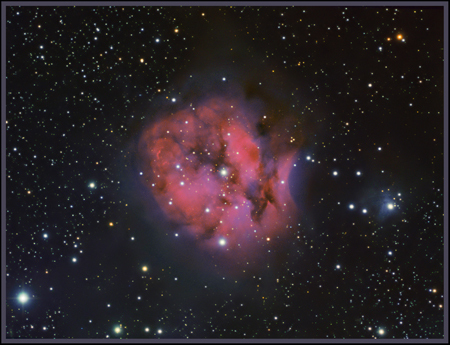 The Cocoon nebula, IC5146, is a combination of both emission and reflection nebulae, and is also surrounded by the dark nebula, Barnard 168, some of which is visible in this image. It is about 4000 light years away and 15 light years across and is an active star forming region. The central star is thought to have formed 100,000 years ago. The strong red colour is from the hydrogen gas cloud, which is being excited by the young hot stars within it and is glowing strongly in the HII part of the spectrum. These are also lighting up the surrounding molecular cloud, which is the reflection part of the nebula, and is the blue in the image. The data for the image was gathered between June and early August 2009, between work and clouds! I initially got some OIII data for this, but it was very weak, as the nebula doesn't glow in this region, so I didn't use it in this image, and gathered RGB data to add to the Ha that I'd first obtained. It could really do with more data, especially blue, but having spent 2 months on it, I felt it was time to move on! Imaged with a TMB152 @ F8, Atik 16HR and astronomic filters from Weymouth, Dorset. Total imaging time. 9 hrs 46 minutes.